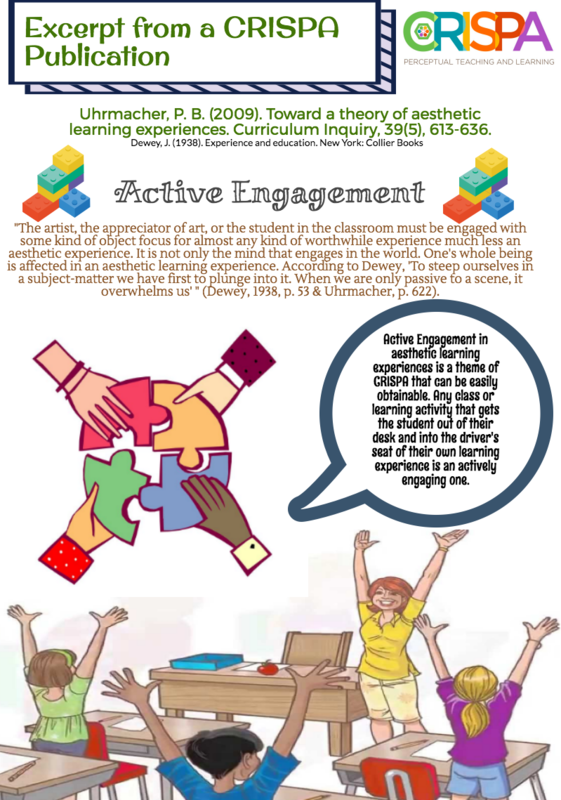 CRISPA is a research-based approach to instruction and planning that relies on the use of Connections, Risk-Taking, Imagination, Sensory Experience, Perceptivity, and Active Engagement. Click the buttons below to explore each CRISPA element. 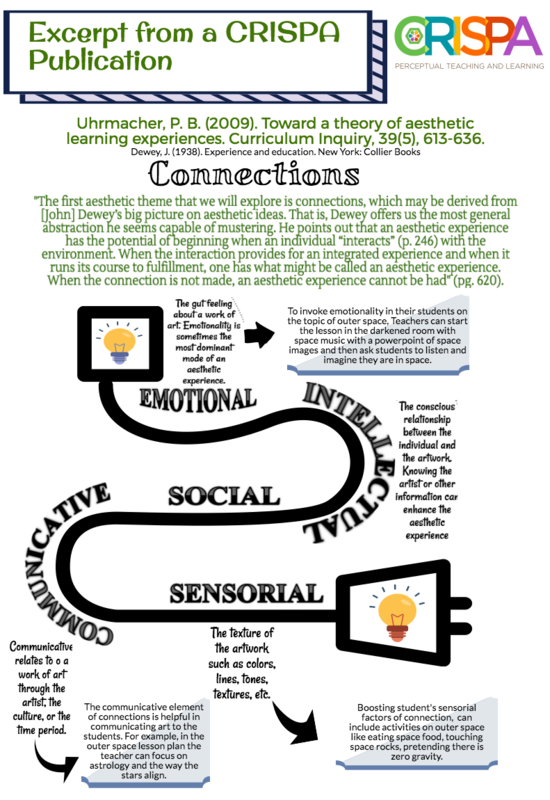 Connections are the ways in which an individual interacts with an idea or object in the learning environment. These connections may be intellectual, emotional, sensorial, or communicative. 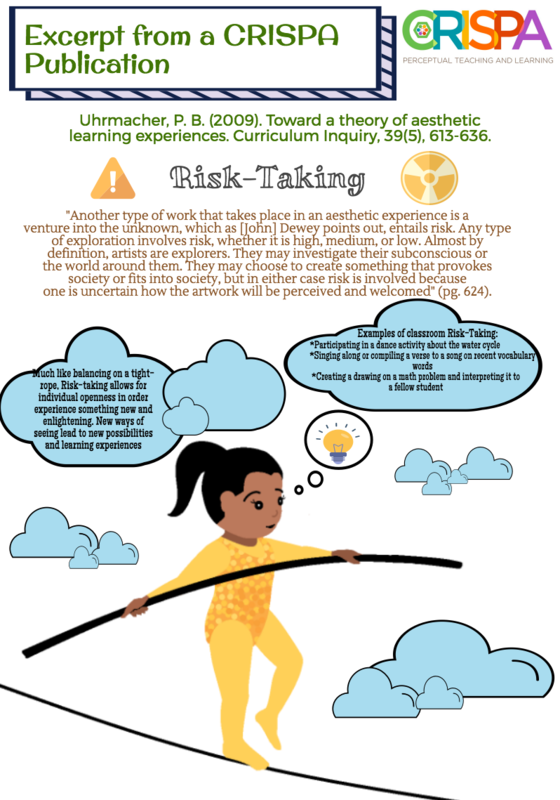 Risk taking refers to students’ opportunities to try something new, to step out of their normal realm of experience. Risks are different for different students. 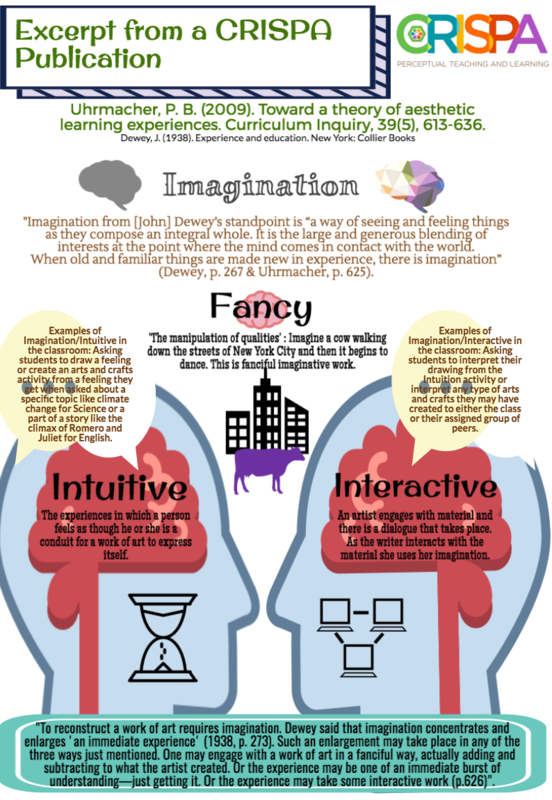 Imagination refers to the manipulation of ideas, which may be characterized in several ways. Imagination may be intuitive, in which a person has a sudden rush of insight; fanciful, in which a person combines unexpected elements such as a talking clock; and interactive, in which a person works with materials to yield a product. 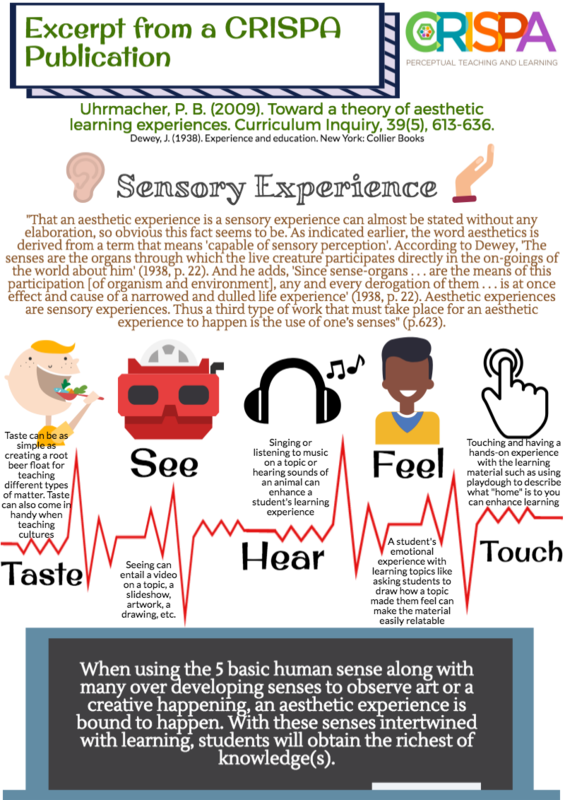 Sensory experience includes at least one person and a sensory interaction with an object. We use the term “object” metaphorically. It may of course refer to an actual object such as a vase or a painting, but also it can refer to a text, a soundscape, a landscape, an image, or simply something focused upon such as birds flying over a barn. 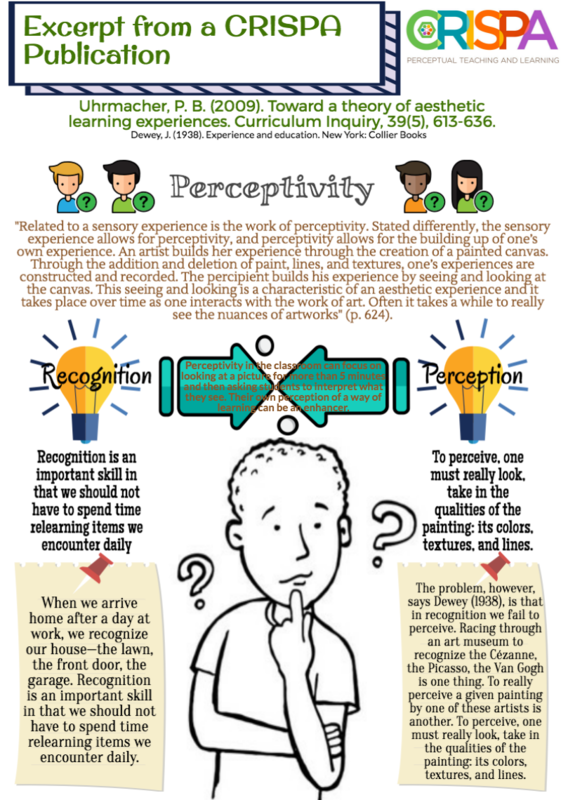 Perceptivity describes a deepened sensory experience. Perception is an achievement and as such can be developed. As an example, we could look at almost any object and notice its surface features, but when we really look and examine it, we begin to notice its subtle qualities. Active engagement requires students to be in the driver’s seat. They should be at the helm of their own learning. This could include making sure they are physically active, or intellectually creating meaning, or making choices about how to represent their knowledge. "The themes are a good tool to help kids connect to content. Many kids just memorize a text or fact for a test, but these strategies can be used to 'experience' content and internalize it more." "The dimensions are really transformative. These could really revitalize my teaching."